The introduction should begin with a "hook" to catch the reader's attention. Here are some possible techniques. DO NOT begin with a question. 1. Opening with an unusual detail: "Manitoba, because of its cold climate, is not thought of as a great place to be a reptile. Actually, it has the largest seasonal congregation of garter snakes in the world." 2. Opening with a strong statement: "Cigarettes are the number one cause of lighter sales in Canada." 3. Opening with a quotation: "Elbert Hubbard once said, 'Truth is stranger than fiction.'" 4. Opening with an anecdote (a little story related to the topic): An anecdote can provide an amusing and attention-getting opening if it is short and to the point. 5. Opening with a statistic or fact: Sometimes a statistic or fact will add emphasis or interest to your topic. It may be wise to include the item's authoritative source. 6. Opening with a invitation to imagine: "Imagine a world in which schools only exist online." You might also use IMAGERY to force to your reader to imagine. 7. Opening with an exaggeration or outrageous statement: "The whole world watched as the comet flew overhead." 8. Opening with an unusual statement: "The fountain of youth could be as close as Florida, or as far as the disillusions of the mind." Because you are analyzing an argument, you can share what the topic of the author's argument is. This is exactly the same thing that is done in a persuasive essay. Explain the two sides of the debate. However, instead of using transitions like "on the one hand/on the other hand", compare what the author of the argument thinks to the opposing point of view. In your thesis statement, you should explain WHO the author is, what three TECHNIQUES s/he uses in his argument, and what the author's goal is ("in order to..."). Remember, your thesis statement sets up the organization of the rest of your essay. Here's an example introduction to guide you... Match the colors in my paragraph to the colors I used in the headings above, and you can see where I put in each element of the introduction. Notice that I used imagery (#6) as my hook, and it flows nicely into my focus in because I can make a connection to the author. Herds of animals forced from their homes. Pipelines zigzagging amidst the stumps of cut down trees. A native people's way of life abandoned. These are the results that Jimmy Carter envisions if the Arctic National Wildlife Refuge is destroyed. While some people believe that proposed industrial developments in the Arctic National Wildlife Refuge would help to solve our nation's oil shortages, Carter believes that these developments would have harsh environmental consequences. In his essay, Jimmy Carter uses imagery, appeal to emotion, and appeal to group identity in order to convince his readers that the Arctic National Wildlife Refuge is a national treasure worth saving. How to Integrate Quotes - Click HERE for a handout in .PDF format that will give you some tips on adding quotes to your evidence section. Your conclusion should explain OVERALL if you think the essay was effective -- it's sort of like you're giving the author a final grade on how he or she used argumentative techniques. Review the analysis parts of your body paragraphs in your conclusion to summarize what was (and/or wasn't) effective. - Papers should be double-spaced. - The font should be size 12, Times New Roman or Arial (your choice). - All paragraphs should be indented (use the TAB key to indent -- it will automatically move over five spaces). - The title should be the same font size and style as the rest of the paper. - There should be no extra spaces before or after the title (just double-spaced, like everything else). - The title should be specific as to the content of the paper, for example: Argument Analysis of Jimmy Carter's Essay. - You do not necessarily need a title page or abstract for a short essay unless your teacher or professor asks for one. However, you do need to format the top of your paper correctly. 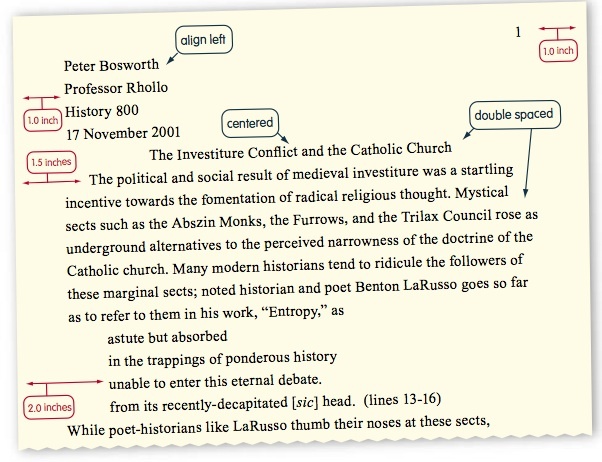 Here is an example of formatting for simple academic papers. Your first and last name should be typed at the top left on the first line. After that, put your teacher's name (Mrs. Britten). Next, put the class you are in (English 11B). Finally, put the date. The date in this example is formatted European-style, so you will need to be careful to format the date in American style, like this: January 6, 2016. Notice how the title is centered on the very next line, and matches the style of the rest of the paper. Share your paper with me in Google Docs: lbritten@student.godfrey-lee.org.